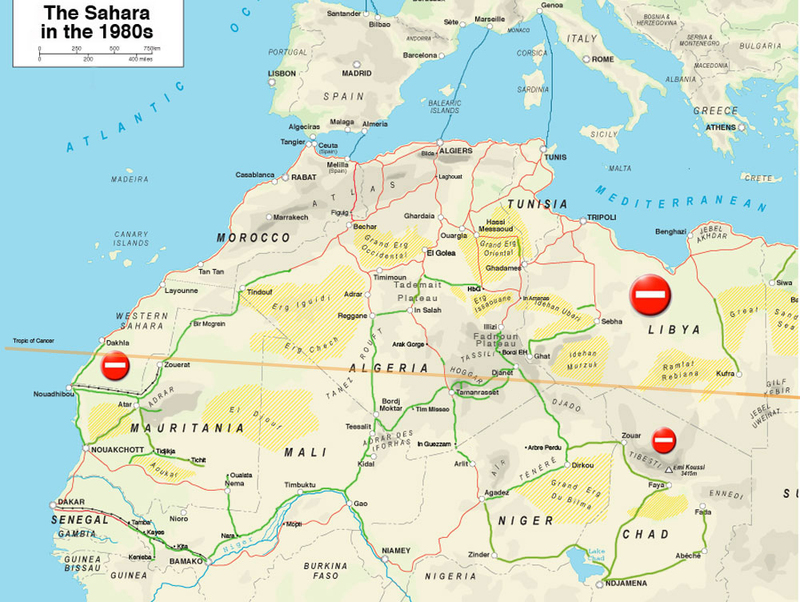 General Sahara map in the 1980s showing most accessible regions, the main road network in red and the principle pistes in green. Click for full size. Links to Google maps covering each trip. Maps in bold have been annotated in detail and refer to events and places described in the book. I’ll get round to annotating all of them. 1982 – Yamaha XT500 – Algeria. 1984 – Bénélé – Algeria (Arak). 1985-6 – Yamaha XT600Z Ténéré – Algeria, Niger, Mali, Senegal. 1987 – Yamaha XT600ZE Ténéré – Algeria (Tam-Djanet). 1989 – Sahara Motorcycle Tour – Algeria. 1990 – Ténéré and Toyota – Algeria, Mali, Mauritania. 1991 – West Africa – Gambia, Senegal, Mali, Guinea Bissau.